Almost any book published over the last 50 years is likely to present a different definition of exactly what constitutes "the babblers." Over 40 years ago, Oliver Austin, in his now classic Birds of the World, summed up the situation by describing this group as "poorly defined and loosely delimited." All of these birds have 10 primary feathers, the outermost shorter than the rest. The tail is composed of 12 retrices. The plumage is soft and loose. Juvenal plumage is never speckled. The legs and feet are proportionately large and powerful, while flight potential is comparatively small (leading, in part, to the great number of species with small ranges). In appearance babblers range from the utterly nondescript to the unforgettable. Despite the great disagreements among most books, one usually finds the babblers arranged thusly. To begin with are several genera of "small brown birds," otherwise referred to as "somber," "dull" or "nondescript." Often their most recognizable feature, at least when they're alive, are their voices. 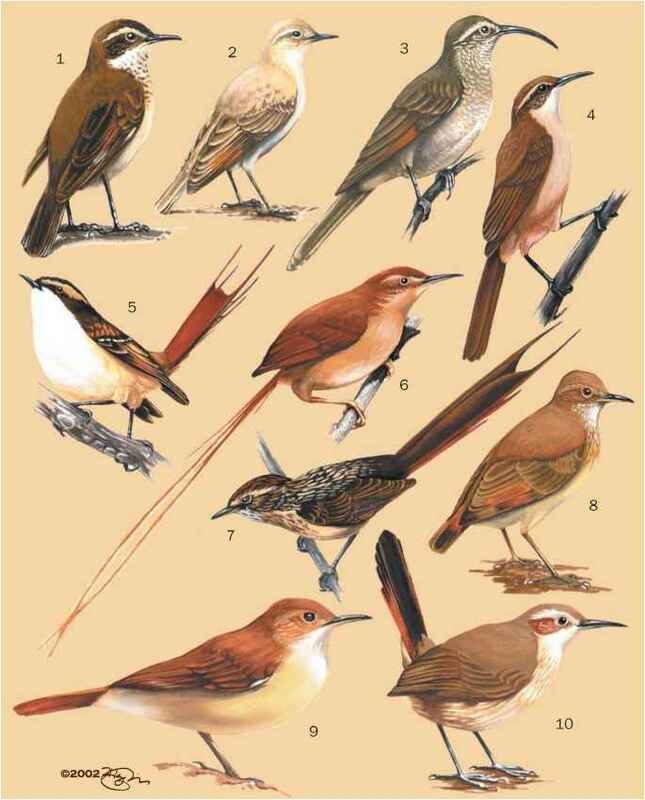 The number of genera is in dispute, but a few more than 30 species compose these "jungle-babblers" (Pellorneum, Trichastoma, Il-ladopsis, Kakamega, Malacopteron, etc. ), all of them tropical, most of them forest-dwellers, occurring through large areas of Africa and Asia. There follow around a dozen scimitar babblers (Po-matorhinus, Xiphirhynchus, and Jaboulleia), named for their long curved bills, some quite spectacular. They appear to be closely related to the around 20 very different-looking wren-babblers (Rimator, Ptilocichla, Napothera, Pnoepyga, Spelaeornis, etc.). These are short-tailed, mostly plump-bodied birds, some tiny, none with brilliant colors, but some with vivid patterns. Some strongly resemble New World antbirds. Scimitar babblers and wren-babblers are Asian, with one species extending down the Lesser Sundas to Timor. What comes next depends on the book one is reading, and here things may differ wildly. Suffice to say that there follows the majority of the babblers, in many genera great and small. Towards the end, one usually finds the parrotbills (Paradoxornis and Conostoma) of Palearctic and Oriental Asia, and the primarily Palearctic bearded reedling (Pa-nurus biarmicus), mostly compact-bodied and long-tailed, many with distinctive bills, one, (Paradoxornis paradoxus), uniquely with three toes instead of four. Finally, one may or may not find the unique and magnificent Picathartes. What they are remains a question.